• Recorded consecutive double-doubles in Washington State’s first program-road sweep of Utah (3-0) and Colorado (3-1). • Hit .483 with just one error, adding 14 digs to notch the Cougs’ first road win over Utes in program history. • Notched a career-high in total kills with 19 and recorded two aces in the win over the Buffs. • Marks her first-career weekly honor and the 28th all-time for the Cougs. Congratulations to @penina_5_penny on being named the Pac-12 Offensive Player of the Week!! • Hit .545 with six kills and three blocks to help defeat the Trojans. • Recorded a match-high seven blocks to go with seven kills and two digs to beat the Bruins and keep Stanford undefeated in the Pac-12. • Marks her first-career weekly honor and the 114th all-time for the Cardinal. 👏 First career weekly honor for Tami Alade and 10th of the season for the 🌲! • Averaged 6.43 digs and 1.14 assists per set in a sweep of Arizona State and a 3-1 win over No. 23 Arizona. • Led all players with 27 digs for her fifth 20-plus dig performance of the year, while racking up a career-high four aces in the win at Arizona. • Has recorded double-digit digs in 14-straight matches and 18-of-20 matches played this season. 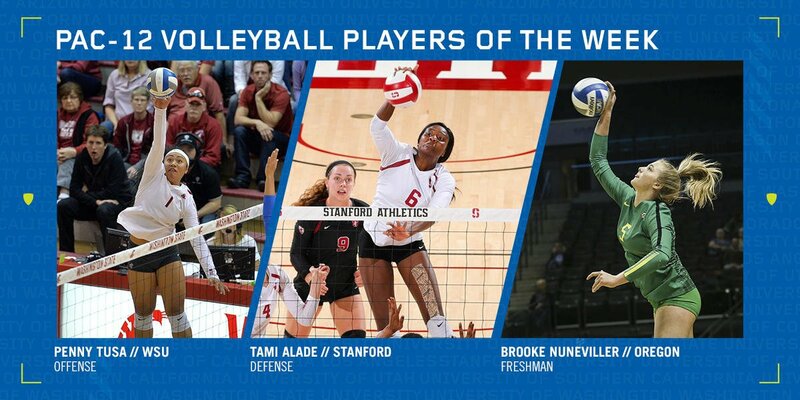 • Marks her third weekly freshman honor this season and the ninth all-time weekly freshman honor for the Ducks. Offensive: Paige Whipple, ARIZ; Preslie Anderson, CAL; Alexa Smith, COLO; Ronika Stone, ORE; Amy Underdown, OSU; Audriana Fitzmorris, STAN; Mac May, UCLA; Kenzie Koerber, UTAH. Defensive: Naghede Abu, COLO; Brooke Nuneviller, ORE; Grace Massey, OSU; Zana Muno, UCLA; Brianna Doehrmann, UTAH; Alexis Dirige, WSU. Freshman: Lauren Forte, CAL; Anyse Smith, COLO; Holly Campbell, STAN; Alexis Light, UCLA; Raquel Lázaro, USC.